This is a fantastic colour choice for Eva LaRue, who opts for a range of medium brown and warm brown shades with subtle highlights and loads of shine to create a warm, healthy glowing look. A roughly centre parted style with the lengths falling in small waves and the front of the hair flicked gently away from the face means that her well-proportioned face is allowed to take full attention. 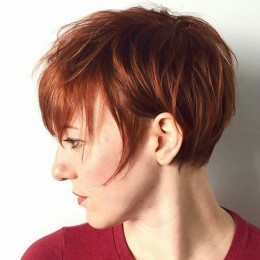 The length is a great compromise between long and medium styles. Actress Eva LaRue wears her naturally dark hair in a centre parting and relies on well-cut layers to add shape and substance to the look. The result works very well – her hair looks great straightened and she avoids it looking flat with ensuring there is just the right amount of volume to provide movement and frame the face. The dark brown colour is lifted by some subtle lighter highlights which give the hair a sun kissed look. Worn with big aviator shade, this is a stylish casual look that is feminine and strong. Warm coppery brown shades are great for making the most out of tan skin tones, and here, Eva LaRue creates a warm, glowing look with loads of Autumnal colours. Her naturally thick hair is styled with a casual, every day look that flatters her face with a parting that is set ever so slightly to the side and small but pretty side sweep. The lengths of the hair have a natural looking wave which adds volume and layers add shape, making this an easy to wear, laid back style. Find more Eva LaRue and latest hairstyle for 2016 on our site.